Sometimes the expression of an emotion has to catch up to the spiritual disruption. Grief is a very strange, powerful, exhausting emotion, and it didn’t really hit me until I opened my mouth and said the words on the phone. “Someone very important to me died this morning. He has been my pastor since I was 15,” I said, requesting to be excused from a retreat I was to have attended addressing the connection between body and soul. How appropriate that in finally saying the words I burst out in tears over the home-going of Rev. Robert D. Goette, good and faithful servant, pastor, husband, father, son, brother, uncle, spiritual father, lover of peanut butter, Bears fan married to a Packers fan, church planter, evangelist, leader, and friend. Someone said Robert may now find himself bored because there is no one in heaven to share the Good News of Jesus with, but he is healed from the ALS that took him physically away from his family and friends bit by bit over the past 5 1/2 years. He lived longer than doctors initially expected, but that’s Robert. Robert was a missionary kid to parents called to South Korea. By the time I met him (I was in high school) he was gathering groups of Asian American kids in the Chicago suburbs – mostly but not exclusively Korean Americans – for Bible study and fellowship. He and sometimes a few volunteers would pick up these kids to meet in the basement of a family’s home and meet Jesus in the form of a tall, lanky, blonde, soft-spoken white dude. Yes, Jesus was white in those years but strangely Korean because of his missionary kid experience. Robert had a unique perspective on and personal connection with the spiritual formation of Korean American children and youth – children of Korean immigrants caught somewhere between being the first and second generation in the U.S. also known as the 1.5 generation. Robert understood that a generation of kids were growing up in the abundance of America with parents who had just experienced the aftermath of a war – the Korean War – and the political and social turmoil that followed. Robert knew that the language and cultural gaps would widen, that Western churches were ill-equipped to welcome us (they were happy to rent their spaces so long as we didn’t smell them up too much with our food, which really was superior to donuts and coffee IMHO), and that Korean churches would lose us because of the very gaps caused by chasing the American Dream. Korean pastors thought he was stealing sheep even though most of us sheep weren’t thrilled to sit in the pews listening to pastors preaching in Korean, couldn’t (or didn’t want to or were never invited to) go to the white church youth groups, or weren’t going to church at all. And I have no idea what his white pastor-peers were thinking as he slowly built the foundation of a church with a bunch of junior high and high school kids. Surely some people thought he was crazy because junior high and high school kids are not the group church planters are going after. That is not the demographic strategic, trained church planters necessarily go after when dreaming of a strong core. Kids are flaky and unreliable. We don’t have an income let alone our own modes of transportation. We bring and create drama (we were K-drama before it was a thing). We are immature in ways our non-Korean peers were not because we also did not have parents who understood America. I’m so grateful Robert was crazy. His investment in my spiritual formation and the formation of a generation of Korean American kids is immense. He understood that my experience as a Korean American child of immigrants was going to mean life and a journey with God would have different turns and curves and bumps and that I would need a place with peers who spoke and understood my heart language – not Korean, necessarily, but a way of understanding and connecting and expressing what our non-Korean American peers could not understand, would never experience, but at some point would benefit from our articulation and expression of it. Robert knew the Kingdom of God needed my generation before most of us cared, and his faithfulness in investing, discipling, mentoring, pastoring, and evangelizing…well, even though it had been a long time since Robert could speak on his own I knew he was still Robert. Even when he ceased to be the senior pastor at Grace Baptist and then Grace Community Church. Even when Peter and I left the church. Even as we stopped seeing Robert and Julie, his wife, on any basis. Even as ALS took away more than Robert’s balance. Robert was still Robert. He was still a missionary, a church planter and trainer of planters, a husband to Julie and father to Jennifer, Emily, and Robbie. And because Robert was faithful I owe him a huge debt of gratitude. Before I knew what ethnic-specific ministry was, Robert and those who believe in Robert did it. They invested in a bunch of kids who grew up to become doctors, lawyers, pastors, investment bankers, traders, and designers. 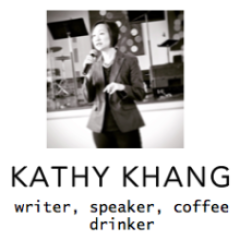 He followed us to Northwestern University, the University of Chicago, and the University of Chicago – Circle Campus; bible studies on those campuses eventually became Asian American Christian Fellowship chapters connected to JEMS – Japanese Evangelical Missions Society and then later affiliated with InterVarsity Christian Fellowship/USA. Yes, the very organization I work with. See? There is so much to be thankful for, so much to remember. Grief is a very strange and powerful emotion. I’m looking forward to being on the other side of it someday. 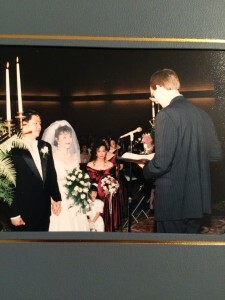 Robert was one of three pastors we had presiding at our wedding. He also was the only one who spoke in English, the only one Peter could understand, and the only one who knew me. Robert didn’t mind being one of three. He understood the Korean family/church politics involved in planning the wedding of two firstborns and the son of founding elders of a church. Peter and I have been married 22 years, and we still remember the gist of what Robert said to us about respecting and cherishing each other. My grandmother Hee Soon Shin passed away this evening at 5:45 pm. She took her final breaths surrounded by two of her children, one of her sons-in-law and two of her granddaughters. She lived a full 91 years in two countries and several cultural shifts. She left this side of heaven with the same grace and strength I have always associated with her. My sister and I were sitting bedside this evening, urging our own mother and aunt out the door so they could run home, change out of their church garb, and return having prepared themselves to keep vigil. We had spent the day together, at one point in the hospital laughing as we noticed my grandmother was being kept company my mother and her two daughters – three generations of women born into varying degrees (if there is such a thing, truly) of patriarchy. My grandmother’s breathing had already slowed, but as they left my mother and aunt paused to say another goodbye. We noticed my grandmother’s breathing continued to shallow and slow. The stillness, another breath, another pause, another breath, another pause longer than the first. I suspect my mother is still holding her breath. Waiting. My grandmother was always a lady. I remember watching her wash her face, a painstaking ritual of cleansing, rinsing, refilling the sink with clean water to rinse her face again. She moisturized religiously, patting, never rubbing, her face. She massaged her neck and hands. Her hair was always cut and styled, her clothes tailored and pressed. She always covered her mouth when she laughed. Fortunately for me and my sister, we inherited some of those genes, though I suspect my tendency to smile and laugh with a wide opened mouth and wild hand gestures are a product of culture and recessive genes. She came with me and my mother to get tattoos. It was actually a multigenerational field trip of vanity – my mother and grandmother having their eyebrows tattooed while I had my eyeliner, top and bottom, done in between nursing Bethany who came along in her car seat. I will never forget the four of us sitting over steaming bowls of rice and soup after having needles poke ink into our skin. Three of us with eyelids and brows puffy and shiny from the assault staring at each other, laughing over what we had just done, looking at Bethany sleeping in her carseat. Four generations of Korean (American) women who would share creased eyelids and a love for fashion, makeup and style. She often vacillated between staunch traditionalist – especially thrilled that her first two granddaughters (me and my sister, the only children of her oldest surviving daughter, would give her five great-grandsons), and moments of almost-feminist – supporting my decision to keep my maiden name legally and professionally. She worried about my career ambitions getting in the way of taking care of my husband and children, but she would often tell me how blessed I was to have a husband who loved and respected me for and encouraged me to pursue those very ambitions. I was supposed to leave for California Tuesday morning for a trip to speak at Pepperdine University’s chapel service Wednesday morning. Those ambitions that often conflicted both my grandmother and my mother (who am I kidding, those ambitions conflicted me!) brewing and developing and growing through writing and speaking and following God’s call and opportunities…instead of speaking to college student’s about the pain of being an outcast and alone and the grace, belonging and power of Christ I will be grieving, remembering, and learning. Sometimes, just when you think you’ve figured life out, life changes. My grandmother lived through the Japanese occupation of Korea, the Korean War, and martial law. She lived through the death of an infant child, her husband, and a daughter all before immigrating to the United States. She was one of “those” people who never learned the language beyond a very, very polite, “I don’t understand. No English.” and yet she remained the matriarch, setting right her three daughters and son and their spouses; four granddaughters and four grandsons; and three great granddaughters and six great grandsons. She and I didn’t meet until I was in elementary school, after my tongue had lost some of its Korean fluency. Over the years, my tongue spoke less and less Korean, but I understood her fierce love for three generations, each generation speaking and knowing less of her world yet still connected through blood and faith. It’s way past my Lenten bedtime, but as I finally make my way to sleep I will remember how my grandmother taught me about self-care, grace, and strength. I will wash and moisturize my face. I will rub lotion into my hands. And I will rest in my Christ’s love. My father-in-law died on Ash Wednesday – the beginning of Lent, a season of reflection on Christ’s suffering, death, burial and resurrection. The morning he died I read out of Bread and Wine: Readings for Lent and Easter. I chose passage about God knowing and choosing to live into human suffering, how the resurrected Christ invited Thomas to touch his nail-pierced hands. I don’t know what it is to suffer the failing health and body of 87 years, but Jesus does, and that is what I whispered in my father-in-law’s ear. My only regret was that I couldn’t translate the reading into Korean, forever the Korean daughter-in-law. Four hours later he took his last breaths, and the family moved into a fog of grief, guilty relief, sadness, memories, cultural expectations, and uncertainty about the future. Paul Si Kun Chang, 87, lived with us for 7 months in 2006. He moved in with us days after my mother-in-law died. Friends of hers thought I wept because I felt guilty for not doing enough as a daughter-in-law. Little did they know I wept because I knew what was coming, and I wasn’t sure I was cut out to be that kind of Korean daughter-in-law. My father-in-law had many moments worthy of a K-drama. He and I argued over the sheer amount of stuff he wanted to move into his room and into my house. The four-drawer, heavy-duty file cabinet and pleather recliner sent me over the edge. He would come into my office and ask to be served lunch. My favorite was when he looked at his plate of spaghetti (the kids had begged for “American” food after weeks of Korean food), and he told me he wasn’t going to eat it for dinner. But we had many more moments as he mourned and tried to find his way out of the sadness while living in the company of a family of five on the move. He trimmed the bushes, rinsed out the garbage cans, tried to teach my boys how to swing a golf club, and he shared with me bits and pieces of his story – how he longed for his mother when he saw me love on my kids, how excited he was to receive confirmation of his arranged marriage, and how he couldn’t believe a poor Korean could live such an incredible life as an American. Stories all spoken to me in Korean, usually when I served him a traditional Korean meal for lunch or dinner. My grief is not that of a daughter; my memories of our relationship only go as far back as my relationship with Peter. My grief feels distinctly that of a Korean American daughter-in-law – “myu-noo-lree”. My father-in-law did not first meet me as a newborn; he met me at my prime grandson-bearing years. We both saw and knew each other in relationship to our cultural roles. It took almost 20 years for us to trust each other with our own stories of faith and suffering and hope. That’s why it made sense to read a Lenten devotional to him on Ash Wednesday while wishing I could have done it in Korean. That was the link that helped us understand each other in ways his son and my husband could not. Death and all of the preparations were a whirlwind until I sat down with the black ribbon to wrap around his portrait and then the white ribbon to make the traditional symbols of mourning the surviving children and grandchildren would wear. Grief, remembrance and reflection did not begin with ashes this year. 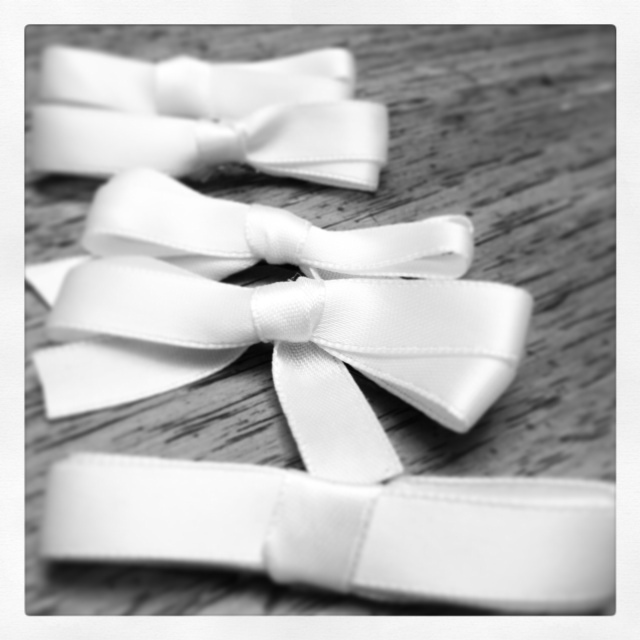 It took form in white bows. The day between death and life and defeat and victory is a long one. I am impatient. I cannot wait. I do not like sitting and waiting. I want to move. I want answers. Good Friday and what Jesus accomplished on the cross doesn’t become Good News until I’ve sat through Friday and Saturday. Until I’ve allowed myself to taste the anguish and utter devastation of losing and loss, of death, of fear. I’ve come as close as a mother ever wants to that kind of anguish, of losing her son while clinging to the tiniest hope that all is not lost forever. No, my son is no Jesus nor is he a savior, but I remember and can still feel that loss and grief and fear and hopelessness wash over me as I picture a curtain not tearing in two but separating us from the flurry of doctors and equipment. And then there was the waiting. The in between I find myself sitting in now. The initial shock and reminders are over, and I wait. There is a way to mark Friday and Sunday but what about the in between? Waiting for Easter and the little boys and girls in their Holy Sunday finest (that is not the fight I chose to fight with my now not so little ones) because it is new and exciting and hopeful and in so many ways easier for me than to sit here on Saturday night. Waiting. There are only a few minutes left of this day, and it is finally time to sit and wait and prepare my heart again. I’m thinking of friends who are waiting and hoping for God to make all things new because the brokenness of Good Friday in our daily lives is almost too much to bear. I remember sitting and keeping watch over my son as he lay in a drug-induced coma thinking I was either going to have to prepare for his burial, just like the women did so early that morning, or find that this time around death would not have victory, just like the women did so early that morning. I am so impatient. Just a few more minutes. It has been a long week. By the end of tonight I will have been at the same suburban funeral home three out of seven days this week. One evening and morning were set aside to mourn the loss of Peter’s uncle, and one evening was set aside to mourn the loss of a friend’s father. The two deaths this week gave way to opportunities to talk. I talked about my mother-in-law’s death with my husband and my sister-in-law – what we remember from the days leading up to and after her death, feelings and memories that rose to the surface after being together at the beginning of the week for Peter’s uncle’s wake and funeral. I talked around death as my parents shared with me some details about their estate since it’s never a good time even though it’s always a good time to talk about life insurance policies and living wills. All this talk, and I’m tired. I’ve been to many memorial services and wakes, but I have found those of first generation Korean immigrants to be some of the most mournful, sorrowful, and emotionally draining. Outward expressions of grief are limited to the occasional sob and cry, but the room is filled in black with a respectful, honoring, but heavy grief. No one but the presiding pastor speaks above a whisper, and stories are told without smiles or laughter. Photo displays may include pictures filled with smiles and fond memories, but the photo by the casket, often marked by two black ribbons around the top two corners, is an expressionless headshot. It’s as if the person knows they will not be around to see this photo that captures life and death. It’s not unusual to see rather large flower arrangements adorned with messages of condolences written on ribbons or banners from the deceased’s or surviving family members’ Korean high school or college/university alumni association. Some of the traditions, even in Christian Korean funerals, are connected to Korea’s Buddhist roots where the dead are wrapped in yellow hemp; the men of the deceased person’s family wear small bows made of yellow hemp and the women still wear small white ribbons (white being the color of death and mourning) signaling to the world around them that they are in mourning. The wake for a high school classmate’s mother was the first example of a different way to celebrate life and death. I walked in and was quickly alarmed and confused. People were sitting casually in small groups around the room, some dressed as if they were headed out to a nice lunch but there was enough color and lightness in the room that surprised me. I was wearing all black. (Actually, I wore a lot of black in those days, but that’s for another post.) They were talking, laughing, sharing tears and memories of my friend’s mother. There was talk about life in the presence of the dead, talk about life with life and laughter. But in neither my Korean or American contexts have I found a good space to talk about death, particularly death in light of the living. I find it fairly easy to talk about those who have already died, but death and ways to celebrate life in death are more often than not reserved for the moments as families plan the funeral. And my faith shall be my eyes. The victory is won, He is risen from the dead. Last Sunday Elias came out of Children’s Church with a tombstone. It was supposed to be a replica of the stone that covered Jesus’ tomb, and on the stone the children were supposed to write what they were thankful for this Easter. Where is the innocent thankfulness for chocolate eggs? To add to my shock, Elias added a drawing after the incomplete sentence – a smiley face, a circle that he had colored in which looked like an exaggerated dot or period, and then another smiley face. Someday I will explain to him how amazingly accurate his picture story was…It was a beautiful Tuesday in June four years ago – a friend took some amazing photographs of Elias smiling and playing in the open fields at Cedar Campus. By Wednesday, Elias had literally gone dark – just like the circle he had colored in – clinging to life, intubated, on a ventilator with nothing for us to do but pray and cry. Two hospitals, a team of doctors and specialists, a battery of tests and we still had no answers. There was nothing to do but wait. By Thursday morning, Elias was back to smiling though still regaining his fine and gross motor skills. It was nothing short of a miracle. And for that miracle we are thankful. Smiley face. Dark circle. Smiley face. For some reason, the pattern makes me think of Good Friday. Holy Saturday. Resurrection Sunday. I can smile on Good Friday because I know how the story ends, just like I can smile now because I know how that week in June ended for Elias. I know that in the midst of Christ’s suffering there remains the shadow of hope that grows and groans. But as we wait to celebrate Easter, there is the dot – a pause button, if you will, filled and empty with silence, stillness, grief, waiting, and certainty because once again we know how the story ends, just like there was certainty for me in the hospital and the life flight to Ann Arbor and in the PICU even if in that moment we didn’t know how the short-term would end. Certainly God was with me and with Elias and with Peter and our other two children and our friend Andrea and her two children who traveled with Peter while I flew with Elias. I was and remain certain of it. Certainly God is in the silence and in the in between. And I smile this morning having been greeted by Elias’ smile and signature, “Oh, Mom!” He doesn’t remember the seizures or the emergency medical flight to Ann Arbor. He doesn’t remember the spinal tap, the multiple scans of his brain and body. He doesn’t remember so much because his life had momentarily gone dark, just like that circle he had colored in. He remembers to be thankful and he really lives life like a celebration. This Easter I have been reminded by my youngest child to be thankful for the smiles and everything in between. Even the circles that have been colored in with darkness because I am certain.